Bed bugs are one of the most common and most feared household pests in the world. Small, blood-sucking, and resistant to a number of treatments, they’ve found their way into many a homeowner’s worst nightmare. However, these same nightmares concerning bed bugs are often the stuff of myth. 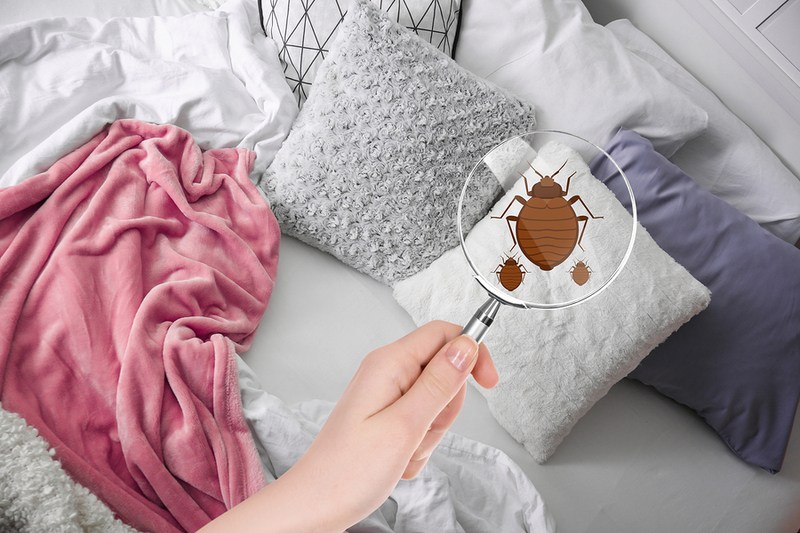 Below, our experts here at EcoClear Products have put together a debunking guide on 10 of the most common myths surrounding bed bugs. Read on to learn more, and shop eco-friendly bed treatment products with our team today! Bed bugs are small parasitic insect pests of the cimicid family. They feed exclusively on human blood and are found in virtually every corner of the world. Adult bed bugs typically reach sizes of 4 – 5 millimeters in length and 1- 3 millimeters in width. They are light brown to reddish-brown in color, flat and oval in shape, and have no hind wings. Their front wings are vestigial and reduced to pad-like structures. Bed bug eggs are translucent in color and roughly the size of a pinhead. Contrary to their name, bed bugs are found are in more areas than just the bed. These parasitic insects prefer locations where human blood is easily accessible. Though the bed is prime real estate for unguarded human blood, it’s not the only place bed bugs will nest. Other areas include but are not limited to clothing, carpets, luggage and upholstered furniture. As a general rule, bed bugs are nocturnal—but this does not mean they aren’t active in the daytime, too. Bed bugs are opportunists and will not waste an opportunity to feed or reproduce, even if it’s during the daytime. By extension, shining a bright light on your space will not keep bed bugs away. As mentioned above, adult bed bugs reach sizes of 4 – 5 millimeters in length and 1- 3 millimeters in width. While small, this certainly large enough to see with the naked eye—especially considering that most bed bug species are a distinct reddish-brown color. Even their tiny translucent eggs, which are usually no larger than a pinhead, can be seen upon close inspection with the naked eye. Bed bugs do not possess functional wings for flight and thus cannot fly. They crawl at speeds of roughly one meter per minute. While bed bugs do not prefer the cold, it takes lengthy exposure to considerably low temperatures (80 hours of continuous exposure to -16ºC temperatures, according to one study at the University of Minnesota) to actually kill them. Add in the fact that bed bugs usually inhabit climate-controlled indoor spaces, and the cold weather of your city becomes all but irrelevant. While it’s true that there are more confirmed cases of bed bugs in cities than anywhere else, this does not have to do with the cities themselves per se. Nor does it correlate to high levels of clutter or unsanitary conditions. Put simply, bed bugs will go wherever their hosts — us humans — can be easily accessed. Bed bugs do not discriminate between rural and urban abodes. As long as there are people around, they’re happy. Since bed bugs infest human spaces to feed on human blood, you’d think they would always bite their hosts in the spaces they infest. Thus, if you’ve got a bed bug problem, bites on your skin will surely tip you off to the infestation. While this is largely true, there are people who not affected by bed bug bites. In fact, studies show that 30% of people do not show signs of bed bug bites when bitten. Homeowners are often quick to jump to conclusions when they wake up with bites, rashes or other strange red marks. However, these symptoms do not necessarily indicate the presence of bed bugs. There are thousands of insect species that can infiltrate homes and bite humans. There are also a host of other allergens that can cause skin irritation that appears similar to bed bug bites. To definitively determine whether your skin issue is caused by bed bugs, you’ll have to find the buggers themselves. Bed bug bites may be uncomfortable (for some of us), but beyond that, they are more or less safe. To date, there have been no reported cases of bedbugs transmitting disease to humans. While there are many bed bug treatment options on the market today, a sizeable portion of these products are less-than-satisfactory for one or more reasons. Many insecticide solutions are either ineffective or environmentally dangerous—or both. Heat treatments, though effective, can be incredibly costly and often require professional assistance. If you are looking for a high-performing, eco-friendly solution to your bed bug problem, we recommend our Stop Bugging Me!™ For Bed Bugs product line. Made from naturally-derived ingredients, these highly-effective products provide broad-spectrum control and prevention for all bed bug species. Follow the link above to learn more, and use our Store Locator to buy Stop Bugging Me!™ For Bed Bugs from an authorized EcoClear Products retailer near you today!